Owners RACV have announced the ‘new beginning’ for the Australian PGA Championship is off to a flying start with the appointment of Graham Marsh Golf Design as designers at RACV Royal Pines Resort. RACV announced in February that it would commit at least $5 million to improve the challenge of the course as part of the agreement to host the Australian PGA Championship at RACV Royal Pines Resort for the next five years. The appointment was made by RACV following an assessment of a short list of candidates by the Championship Planning Committee, involving golf experts from the RACV, PGA of Australia and ALPG. Sue Blake, Executive General Manager, RACV Club and Resorts, said the Committee was very impressed by the initial design concept which Graham Marsh Golf Design had proposed. “Graham impressed us with his wonderful ability to meet the needs associated with one of our top resort courses also being a test of golf for both men and women professional players, each at their championship levels”. Marsh, the 1982 Australian PGA Champion, also designed the Resort’s most recent addition of nine holes which opened in 2004. His design firm has been responsible for dozens of golf courses on every continent, including such notable Australian courses as the Vines Resort, Palmer Gold Coast, Paradise Palms, Palm Meadows, Horizons Resort, Secret Harbour, Twin Creeks and Terrey Hills. Ms Blake said the exciting design concept will be refined in coming months but would include substantial changes to all green complexes, fairway bunkers and greenside bunkers, with some holes being redesigned and improvements made for spectators. It’s understood most of the major earthmoving work required to upgrade the golf course will not occur until the 2014 Ladies Masters is staged early in the new year. 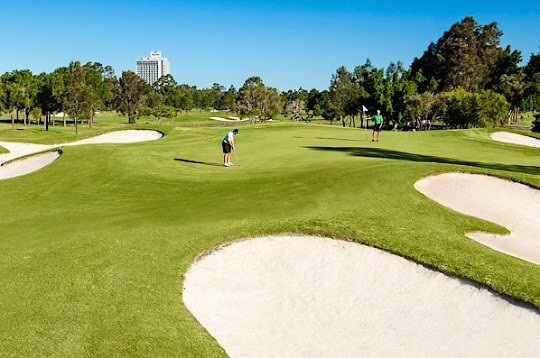 The Australian PGA Championship will be held at RACV Royal Pines from 7th – 10th November 2013.